Hmmm. Come the summer-cocktail season, I head for the nearest bottle of tequila or Campari. I’m not a bourbon drinker — discounting a certain summer long ago when I learned to appreciate that southern comfort at the Chalfonte Hotel in Cape May, N.J. There, a tribe of elbow-bending debutantes, bellhops, and busboys (imported from “Vuh-gin-ya” to add flavor to the southern hospitality the hotel proudly professed) had that hearty hooch in their blood, literally and figuratively. While that refreshing muddle of mint, bourbon and “shug-uh” poured over ice may be found all around town, having the proper vessel to pour it into is an imperative. For that, you should pay a visit to bartender Jim Romdall at the aptly named Vessel — or head over the bridge to the Naga bar at Bellevue’s Chantanee Thai and seek out head-bartender Andrew Bohrer. They’ve got the classic silver mint julep cups (see photo, above), and they know how to use them, Hess insists. He also give props to the Murray Stenson’s magical muddling abilities (you’ll find Murr the Blur on the Hillclimb at Zig Zag). Ditto for barman Jamie Boudreau (found Mondays and Tuesdays at Tini Bigs). And in case you want to get cracking (ice, that is) and practice before you preach the gospel of the julep, may I suggest you watch this video, in which the Drink Boy himself shows you exactly how it’s done. Anybody else want to weigh-in? 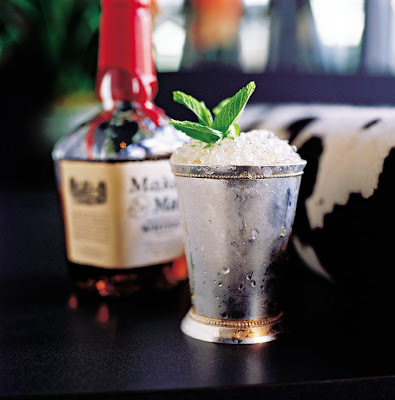 Where do you go for a great mint julep?